Ukraine should be a computer science superpower. Famed Ukrainian computer scientist Sergei Lebedev unveiled the first Soviet computer -- and indeed the first in continental Europe -- on December 25, 1951. Today, Ukraine already provides the world with backend support thanks to its 50,000 computer science university graduates. It enjoys a largely free and open Internet. More than half of Ukrainians are now online and approximately 90% of Ukraine’s businesses use regular broadband or WiFi access. Last year, Ukraine’s economy expanded by a mere 0.2 percent. If Ukraine’s businesses could increase their Internet use intensity from 25 to 35 percentage points, the GfK study calculated that it could have grown GDP by 1.2%. 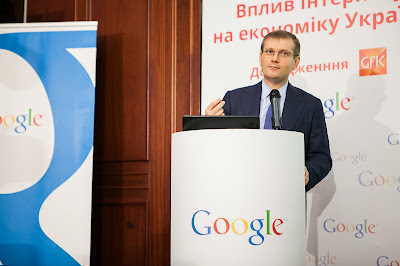 At the study’s launch event, Vice Prime Minister Alexandr Vilkul highlighted the importance of Internet for Ukrainian business and confirmed his and the Ukrainian government’s support for the digital economy. Individual Ukrainian companies gain by going online, the study show. Businesses with more active Internet navigated turbulent economic conditions in 2012. Their profits decreased only by 0.7% while companies with a weak Internet presence suffered a 7.3% drop. Amid Ukraine's tough economic climate, the online sector still is seeing tremendous growth. Hopefully, the report will alert Ukrainians - government officials, business leaders and technology leaders - that the Internet could do even more to drive forward a transformation from its agricultural and traditional industrial past to a shining digital future.